New to war games and looking at Flames of war and/or Bolt action as my first games. I have a vague idea of what it will cost per miniature. but with-out owning any rule books its hard to tell how much it will cost to field an X point army. For example a minimum point and a basic point game. How would this change if I decide to go tank heavy with FoW? which is a very cool wargame. But how much $$$ will I have to drop for a basic point Game. I just need a ball-park average. I only have the BA rules around. A typical rifleman is about 10 points, an average officer about 90, a 2-men MG team 50 points, a 8cm/3" mortar team also 50 points, and a typical late war medium tank about 200 or so. So a platoon of 25 men + an officer, a MG team and a mortar team, plus a tank will run you about 650 points. Obviously there are a lot of variation, but 750pt is quite typical for a BA game. I've also heard that lately a lot of FoW players are also favoring a 750 point game with more emphasis on infantry, as it makes for a better game. where the miniatures are already painted. When you buy a box you know exactly what it will cost you to play the game. For Flames of War this site will help you build forces so you can gauge prices. Most FoW tournaments play 1500 or 1750 pts. Thank you all, you have been most helpful. Bunch of assholes who think they are funny. I hope this doesn't give you a wrong impression about the site. I can't help you, but you might find more answers from the Flames of War: The World War II Miniatures Game forum. Just roll down the page and you'll find it. The Bolt Action starter army packs are $128 US retail for a 1000-point army. Based off all the resources given in the previous posts and diligent combing of amazon I think I've come to an answer. And if buying only tanks for Fow its 8:$1. all-most twice the cost. Assuming my Fow calculation is correct it would cost $96-$187 to get a 1500 point starter army. As Nicholas confirmed my math: It will take a min.$100 to reach a 750 point army. Although I would go the extra $28 and get the starter kit. But I'm a special case as I have to double all these figures b/c I would be buying for my brother too. I don't see the point in points/$ even if there were a good way to calculate it. Being an artificial construct, points don't directly translate between games, so using them as the link between games doesn't really make any sense. You will find on the FoW forums a section dedicated to lists from 600 points to over 2000. From there you can determine what you might want to emulate and in the online store are all the MSRP to complete your calculations. 600, 1500, and 1750 are very common point sizes in FoW. The point is how much do i have to spend just to start playing. Because I'm buying for two, this is very important. Seriously, i was not aware of the existence of Bolt Action. After a bit of reading, I will definitely look into this game. 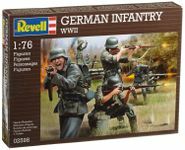 On the BGG site, some users suggest that one could start with very low-cost miniatures by companies like Revell at the 1/72 scale, and then order "real" miniatures once you are convinced the game is for you. In calculating your cost you need to factor in the cost of terrain and painting materials. Then there is the time to assemble and paint your armies and build terrain. If you do this yourself it's free but if you pay someone else to do it because you don't have the time or skill, then it will cost you a lot more. Each time I read threads about miniatures, I have myself wondering how come painted miniatures are so rare on the marketplace. Who has the time to paint all these small objects ? But that's not what you're measuring by looking at points/$. I would consider a starter Warmachine army to be in the 15-35 point range. 35 points probably doesn't even get you a leader for your starter army in Warhammer, where a starter army is going to be well into the hundreds of points. This is why you can't use points as the bridge between systems to compare costs. Points being an concept internal to a game system have no meaning outside of that particular system. What you are interested in is the cost of two starter armies. This has some sort of meaning. Points/$ of two different systems does not. That said... points/$ *does* have some usefulness inside a system when looking at building your starter armies. You have the cost of a bolt action starter army. For Flames of War for two people, you will need two of the 'Open Fire' starter boxes (at about $70 each). One player takes the allies from both boxes, the other player takes the Germans. With two boxes you can build 1500 point armies for both sides, which is the points level that most people play with. The German army will be mostly infantry. The figures are great, but if you don't feel like painting them you may want to get a couple of extra Tiger or Panther tanks -- they cost a lot of points, so a few tanks means you need to paint less other stuff. The German army is a lot harder to paint, with camouflage patterns etc. But you can spray paint the tanks the basic dark tan undercoat they used, and add the camouflage later. Also note that you can use the 15mm figures in the open fire set to play Bolt Action as well. Personally, I think Bolt Action looks better in 15mm! Very strongly agreed. I think both FoW and BA look and play better if you drop one size down from the "official" figure size - 15mm for BA, 10mm or 6mm for FoW. It makes the weapons range more realistic compared with figure size. Not to mention it is much cheaper. I do the same thing. Potentially limits your organized play options in the future though, so if that's remotely interesting, you may want to keep it in mind. Though I think 6mm is a bit too small for FoW, 10mm is nice. Have you seen Chain Of Command from Too Fat Lardies. Platoon level WWII action with some really interesting mechanics. You can buy the rules as a downloadable pdf. Get some cheap 1:76 figures and you are away.